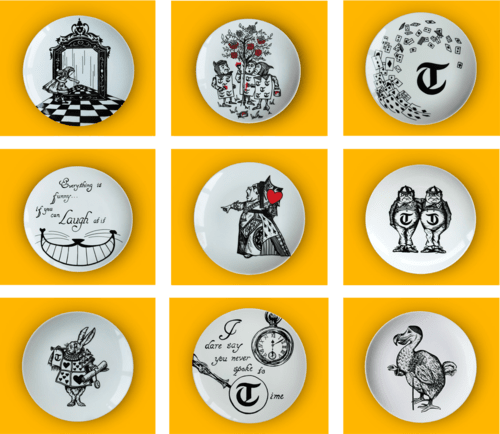 In April 2013, a year after I had left University and working as a freelance illustrator, I was asked by a friend if I might like to illustrate a set of Alice in Wonderland inspired plates for The Telegraph newspaper for their tent at the Hay Literary festival. Knowing what rich source material the Wonderland story would provide I set about creating what would become my first collection. For the majority of the designs I wanted to draw on the incredibly detailed original illustrations by John Tenniel. Rather than simply photocopy them, I stayed meticulously faithful to the originals and re-illustrated a collection of drawings from the book line by line in pen and ink, adding colour, quotes and my own compositions to what is now our popular Alice collection. 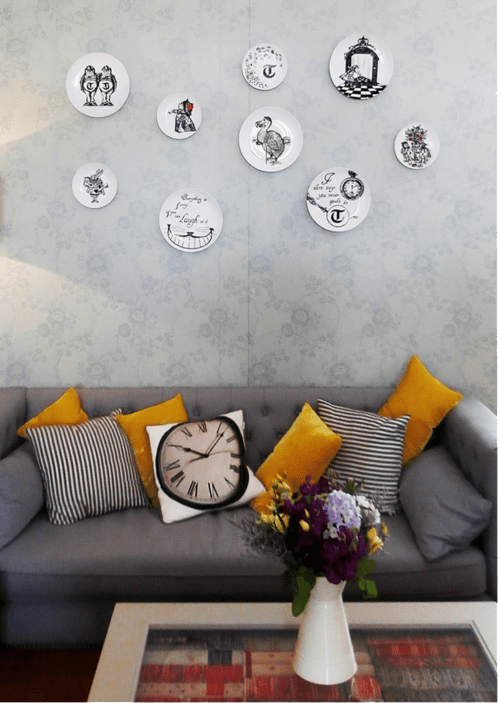 Having loved designing and creating the plates, I had a bit of a light-bulb moment as I realised that there I was with a product that I could potentially share with people – and so a business began. After working up a few more designs, I sourced a lovely pottery in Stoke-on-Trent who still produce all our ceramic pieces today where each illustration is screen-printed and hand decorated on to every plate and every mug by a talented team of crafts men and women. Once the first collection had been produced I couldn’t wait to get it out in to the world and start selling it. I came upon a rather intriguing if not daunting opportunity advertised by ‘Pop up Britain’ (part of Enterprise Nation) to join a group of other creative businesses to be the launch group for the first of many weeks at a pop up shop in the heart of London in Piccadilly Circus. The brand officially launched that week where I also took the opportunity to introduce our first greetings card range in what has proved to be our now rather popular Alphabet Collection featuring an A-Z of tiny people getting up to tiny things. I was fortunate enough to meet my first stockist in Piccadilly Circus in the form of the British Library. Not only do we still stock our Alice Collection with them to this very day, but they also have the original Alice manuscript which is a rather nice way to complete the circle having gone from being inspired by the book to start a business to now having our products stocked along side it. Plus I have also had the privilege of being in contact with descendants of Lewis Carroll himself, and you don’t get a bigger Alice in Wonderland seal of approval than that! From that first week, and from that first stockist, the business has continued to grow with great opportunities such as securing a dream stockist in Liberty who still stock our Alphabet Collection today, to appearing at our first trade show in January 2014 at Top Drawer and we have continued to show at Trade shows ever since. From my first product to our current pieces, I have always been committed to creating illustrations and collections that are fun, original and committed to being produced using the best quality materials made by the best quality manufacturers. So far I have managed to achieve all this upon British soil with I’m very proud of. There’s always something new bubbling away in the studio as we constantly update and add to our collections alongside launching new work. Since our first Alice and Alphabet collections, we now have two new collections including our ‘Tiny’ collection of tiny people getting up to tiny things, and in addition our latest ‘London’ collection of iconic figures and methods of transport from across the capital including the Queen and her infamous corgis to flying Routemasters driven by Santa for Christmas. Our products can now be found from the Isle of Wight to Spain, in iconic institutions and retailers such as Harrods and the British Museum. Welcome to Eleanor Stuart, a luxury British stationery and giftware brand.